"The new Indo-Pacific department will mean the creation of a curatorial position. Ruth Barnes, textile curator in the department of Eastern Art at the Ashmolean Museum in Oxford, England, will join the faculty, first as a consultant in April and full time in 2010. And a new gallery devoted to Indo-Pacific art is scheduled to open around 2012, once the three buildings that house all of the Yale University Art Gallery are renovated ... ."
Wikipedia is teaming up with Flickr and a number museums and cultural institutions worldwide, including our own Metropolitan Museum of Art, in a photographic scavenger hunt. The contest's ultimate aim is to source illustrations for Wikipedia articles. During the month of February 2009, small teams of photographers will seek out images within a given museum or cultural institution that illustrate subjects on a list provided by Wikipedia. Images uploaded to the Flickr group will be used to illustrate Wikipedia articles. When an images is used, points are awarded to the team that provided them. Score the most points and win a prize. For years we have been dissatisfied with the large expensive art history textbook. We found that they were difficult for many students, contained too many images, and just were not particularly engaging. In addition, we had found the web resources developed by publishers to be woefully uncreative. We had developed quite a bit of content for our online Western art history courses and we had also created many podcasts, and a few screencasts for our smARThistory blog. So, it finally occurred to us, why not use the personal voice that we use when we teach online, along with the multimedia we had already created for our blog and for our courses, to create a more engaging "web-book" that could be used in conjunction with art history survey courses. We are also committed to joining the growing number of teachers who make their content freely available on the web. smARThistory.org is a free multi-media web-book designed as a dynamic enhancement (or even substitute) for the traditional and static art history textbook. Dr. Beth Harris and Dr. Steven Zucker began smARThistory in 2005 by creating a blog featuring free audio guides in the form of podcasts for use in The Museum of Modern Art and the Metropolitan Museum of Art. Soon after, we embedded the audio files in our online survey courses. The response from our students was so positive that we decided to create a multi-media survey of art history web-book. We created audios and videos about works of art found in standard art history survey texts, organized the files stylistically and chronologically, and added text and still images. We are interested in delivering the narratives of art history using the read-write web's interactivity and capacity for authoring and remixing. Publishers are adding multimedia to their textbooks, but unfortunately they are doing so in proprietary, password-protected adjunct websites. These are weak because they maintain an old model of closed and protected content, eliminating Web 2.0 possibilities for the open collaboration and open communities that our students now use and expect. In smARThistory, we have aimed for reliable content and a delivery model that is entertaining and occasionally even playful. Our podcasts and screen-casts are spontaneous conversations about works of art where we are not afraid to disagree with each other or art history orthodoxy. We have found that the unpredictable nature of discussion is far more compelling to our students (and the public) than a monologue. When students listen to shifts of meaning as we seek to understand each other, we model the experience we want our students to have—a willingness to encounter the unfamiliar and transform it in ways that make it meaningful to them. We believe that smARThistory is broadly applicable to our discipline and is a first step toward understanding how art history can fit into the new collaborative culture created by web 2.0 technologies. Maria Gilbert of the Getty Museum started an interesting (and, I’m sure, evolving) conversation this morning about institutional “brands” on Twitter. The discussion was sparked, in part, by a recent post from Ari Herzog assessing the Museum of Modern Art’s own online presence. Twitter, and specifically how to use it in an institutional capacity, has of late been a hot topic at the Met as well, and the time seems right to lay out some of my own thoughts on the subject. Welcome to my New Year’s resolution to write more here at kovenjsmith dot com. Woot. I think that the process of trying to figure out how to use so-called “social media” platforms like Twitter and Facebook has essentially accelerated the disintegration of what we used to call “the institutional voice”; that single, monolithic, thoroughly-vetted voice that spoke to you, the visitor, from a given museum’s publications, press releases, and Web site. As more and more low- or no-cost publishing platforms have become available over the last decade, we’ve seen an erosion of this single voice, as individuals from institutions are able to publish more quickly without going through a traditional vetting process. The question for museums is then: when that voice is gone, what replaces it? I find, on Twitter, that institutional or company feeds are always less interesting than personal feeds. They’re informative, to be sure, and often highlight things about a given institution (a work of art, an upcoming program) that I might not have otherwise known, but they lack that certain personal angle that makes for a really good feed. I agree with Tyler Green that the primary focus of a museum feed should be Art, but an institution can’t be as free with its opinions as an individual can be. If an art museum were to say something like “this portrait looks like Billy Dee Williams” in its Twitter feed (and let’s hope that happens), I’d have to wonder, as a follower, whose perspective that is. Does someone in the marketing department think that? Does the curator? An educator? The Web site director? As an institution, then, we’re reduced to posting somewhat bland tweets–daily highlights of works from the collection (something better suited to an “Artwork of the Day” desktop widget), or advertisements about half-price admission days (which probably belong in a marketing newsletter). However, this problem of perspective goes away if you replace that single feed with a diversity of feeds from your staff. Think about it. Friendships in the virtual space are not much different from friendships in real space. I’ll never be “friends” with MoMA, no matter how much I may love it as a museum, but I could easily imagine being friends with MoMA’s technology people, its curators, its educators, or its conservators. MoMA The Institution might not feel free to say that a particular work in its collection is sub-par, but a curator on MoMA’s staff might be willing to tweet at length about why that work is sub-par. I may not agree with that perspective, but it’s still an interesting one to read (and potentially joust with as well, via @ replies). As a follower, I’m not engaging with the institution per se, I’m engaging with one of many possible viewpoints from within that institution. This would have the end result of actually connecting me to the institution in a much more powerful (and one would hope, lasting) way. This doesn’t mean that a single institutional feed has no value. In fact, as Tim O’Reilly points out in a recent post, he finds that his own Twitter feed often works as a kind of switchboard, connecting his followers to individual feeds within O’Reilly Media. One could certainly imagine an institutional feed taking this role, functioning almost as a party host introducing various guests to one another. Although it seems likely that Twitter is about to break into the mainstream, we’re all still really trying to figure out how best to use it. It’s not a blog, it’s not e-mail, it’s not a Web site–it’s something entirely different that, I believe, has the potential to fundamentally change the way museums interact with their public. In “Remix,” Lawrence Lessig states that “…despite the rhetoric of the content industry, the most valuable contribution to our economy comes from connectivity, not content. Content is the ginger in gingerbread–important, no doubt, but nothing like the most valuable component in the mix…” It will be interesting to see if this will become true for museums as a result of engagement with platforms like Twitter. h/t to Joy Garnett (from the Goldwater Library at the Metropolitan Museum of Art) for the Lessig quote. Koven J. Smith is the Musical Director of cornfield dance, as well as a producer of interactive technologies at the Metropolitan Museum of Art and an adjunct professor of Information Technology for the Visual Arts at New York University. With a background in electroacoustic music, formal composition, and new media design, Koven's work explores the intersection of multiple art forms and technology. Barkley L. Hendricks’s “Sir Charles, Alias Willie Harris” (1972) plays on the Three Graces. I saw this jaw-dropping show and couldn't help but notice the influence of Bamako portraiture (scroll down to bottom). Barkley L. Hendricks did not birth the cool — that was Miles Davis — but his suave portraits from the 1960s, ’70s and early ’80s give him the right to use “Birth of the Cool” as the title of his five-decade retrospective at the Studio Museum in Harlem. Mixing realism, abstraction and Pop, Mr. Hendricks’s life-size paintings of beautiful black people in extravagantly fashionable outfits against flat, single-color backgrounds captured a period sensibility with uncanny acuity. They also made him famous: he was included in numerous museum exhibitions and featured in a Dewar’s Scotch magazine advertisement. Today, with figurative art resurgent and portrait painters like Kehinde Wiley, Elizabeth Peyton and Chuck Close enjoying great popularity, Mr. Hendricks’s work is back in style. The exhibition was organized by Trevor Schoonmaker, curator of contemporary art at the Nasher Museum of Art at Duke University, where it appeared earlier this year. Mr. Hendricks’s spirit is epitomized in a self-portrait called “Slick” from 1977, in which the bearded artist appears shirtless in a snowy-white, double-breasted suit against a matte, slightly off-white background. He wears a colorful African skullcap and a fine gold necklace with a little votive leg hanging from it, has a toothpick jutting from one side of his mouth and gazes back at us through gold-rimmed glasses with a calm, appraising mien. He is perfectly composed in all senses of the word. Many complexities unfold from what might seem at first to be a fairly straightforward picture. The clothes bring to mind cinematic, disco-era associations: “Shaft,” “Saturday Night Fever.” The skullcap evokes the period’s surge of Afro-centric pride and the influence of African art on European Modernism. Image: Chrysler Museum of Art, Norfolk, Va. The first painting in this exhibition that shows clearly where Mr. Hendricks was headed is a head-and-shoulders portrait of a young African-American soldier, whose olive-green helmet and shirt harmonize with the bright-green background. It was 1968, and Mr. Hendricks was serving in the National Guard a year after graduating from the Pennsylvania Academy of the Fine Arts and two years before he would head for Yale, where he would earn his Master of Fine Arts in 1972. Besides its finely tuned formal qualities, the painting of the soldier is historically arresting. You can’t help but think about Vietnam and the disproportionate number of African-Americans who fought and died there. It makes no explicit statement about the war; nor does it overtly comment on the racial strife at that time. But because the young soldier has his eyes meditatively closed in the shadow of his helmet’s brim, and because the painting allows the viewer mental space to reflect on its implications, it has a haunting resonance. That Mr. Hendricks was keenly aware of how paintings play in the socio-political arena is shown most conspicuously in a full-frontal self-portrait from 1977 in which he is wearing only sports socks and sneakers, some jewelry, glasses and a white leather applejack hat. The title is “Brilliantly Endowed,” a double-entendre that plays on a favorable review of Mr. Hendricks’s work by Hilton Kramer, then an art critic for The New York Times, who wrote that Mr. Hendricks was a “brilliantly endowed” painter. With understated economy, the painting mocks American fantasies about the black male body. But the clothed body would be Mr. Hendricks’s signature subject. His interest as a portraitist was not in private selves but in public personae. See, for example, “Sir Charles, Alias Willie Harris” (1972), whose subject, in a play on the Three Graces, appears in triplicate — facing right, left and into the background — wearing a scarlet trench coat, black suit, white turtleneck and two-tone wingtips. Mr. Hendricks toys ambiguously with stock associations. Hollywood stereotypes of disreputable characters often played by black actors — pimp, drug dealer, gangster — come to mind. On the other hand, Sir Charles could be a magazine fashion model or a real-life dandy. So there is a provocative connection between the individual person and Pop culture — much enhanced by the unspoken background of racial craziness in America. Some people seem more real. In “Sweet Thang (Lynn Jenkins)” the subject reclines on a couch blowing bubble gum. A young woman named Tequila in a 1978 painting has a look all her own: in loose, bright-red below-the-knee shorts, canvas basketball sneakers, striped athletic socks, a wide-collared sailor shirt, denim jacket and a long-billed cap, she poses with one fist on her hip, a cigarette in her other hand and an amused, slightly skeptical expression. Recently he has returned to life-size portraiture, and the exhibition includes an example from 2002. An image of the African pop star Fela Kuti performing in an orange track suit with a gold halo over his head against a golden, tapestrylike field, it has a wide, wooden frame and a collection of high-heel shoes on the floor in front of it representing the singer’s 27 wives, or “queens.” You can imagine a series of hagiographic tributes to other artists following from this, but for now Mr. Hendricks’s most memorable achievement remains his early pictures of coolness personified. “Barkley L. Hendricks: Birth of the Cool” is at the Studio Museum in Harlem, 144 West 125 Street, (212) 864-4500, studiomuseum.org, through March 15. Bottom: Seidou Keita; image via. Dazzling textile traditions have constituted an important form of aesthetic expression throughout Africa’s history and cultural landscape. Textiles have long been a focal point of the vast continental trading networks that carried material culture and technological innovations across regional centers and linked Africa to the outside world. Leading contemporary artists reflecting on Africa’s distinctive cultural heritage and its relationship to the world at large have drawn upon the imagery of textiles in sculpture, painting, photography, installation art, video, and other media. This exhibition illustrates the stunningly diverse classical textile genres created by artists in West Africa through some of their earliest documented and finest works. Highlights of the Metropolitan’s own holdings will be presented along with some twenty works that entered The British Museum’s collection by the early twentieth century. Selected works will represent inventive variations on major themes of the influential classical genres. The exhibition will relate these genres to contemporary art forms by affording an appreciation of the cultural context and visual language of these traditions and exploring their synergy and resonance in works by eight living artists. The publication The Essential Art of African Textiles: Design Without End produced by The Metropolitan Museum of Art and Yale University Press will accompany this exhibition. The exhibition is made possible in part by The Andrew W. Mellon Foundation, Fred and Rita Richman, and The Ceil & Michael E. Pulitzer Foundation, Inc. It was organized by The Metropolitan Museum of Art, New York, in collaboration with the British Museum, London. Following the lecture is a panel featuring artists whose work relates to the exhibition and leading scholars in the fields of art history, history, and African studies. Alisa LaGamma, curator, and Christine Giuntini, textile conservator, both of the Department of the Arts of Africa, Oceania, and the Americas, The Metropolitan Museum of Art, moderate. This lecture and panel discussion are organized by The Metropolitan Museum of Art in collaboration with New York University’s Africa House and Grey Art Gallery. Programs are free with Museum admission contribution unless otherwise noted. University Center for Human Values, Princeton University. Africa’s cultural heritage has much to tell us about the region’s relationship to the world at large. The vibrant textile traditions of Africa are extremely diverse in materials, modes of production, and motifs. Dazzling silk and cotton kente woven in Ghana, earth-toned mud cloth from Mali, and deep indigo–toned fabrics dyed in northern Nigeria all reflect cross-cultural connections. Sunday, 12:00–5:00. You may also visit the Concerts & Lectures box office in the Museum’s Great Hall, Tuesday–Thursday, 10:00–4:30, Friday–Saturday, 10:00–7:00 and Sunday, 12:00–5:00, or go to www.metmuseum.org/tickets. Contemporary artist El Anatsui, whose work recently acquired by the Met is a centerpiece of the exhibition, discusses his art in an interview with Alisa LaGamma, curator of the exhibition. New York University’s Africa House and Grey Art Gallery. This afternoon program focuses on Africa’s rich textile tradition in a contemporary context. Department of the Arts of Africa, Oceania, and the Americas, The Metropolitan Museum of Art; and John Mack, Professor of World Studies, Sainsbury Research Unit for the Arts of Africa, Oceania, and the Americas, University of East Anglia. The Michael C. Rockefeller Wing, first floor. Ghana, with an introduction by Awam Amkpa and Lydie Diakhaté, founders and directors of the festival. Due to seating limitations, these screenings will be ticketed. Tickets are free with Museum admission and may be picked up on a first-come, first-served basis at the Event Desk in the Uris Center for Education beginning at 5:00 on the afternoon of the event. All screenings occur in the Bonnie J. Sacerdote Lecture Hall, Uris Center for Education. of three women from the “red city” Oualata—at the extreme east of the Mauritanian desert. As they paint and decorate the city walls, the women express themselves with a surprising sense of freedom in a society dominated by tradition, religion, and men (56 min.). Arabic with English Subtitles. Co-winner of the 2008 Walter Mosley Award for best documentary in the international competition. Bonne arrivée à Bamako (1998), directed by Karim Akadiri Soumaïla (France/Nigeria). Follows the journey of the Paris-based Malian fashion designer Xuly Bët (born Lamine Badiane Kouyaté) to Bamako, where he returned to create a new collection based on local materials and fabrics and to meet the photographer Malick Sidibé (52 min.). French with English subtitles. that his father has passed away. According to Nigerian tradition, the first-born is responsible for a father’s burial, and Merz begins a journey of discovery back to his origins and a family he hardly knows (75 min). Co-winner of the 2008 Walter Mosley Award for best documentary in the international competition. These screenings are organized by The Metropolitan Museum of Art in collaboration with the Real Life Documentary Festival. 2006 sculpture Between Earth and Heaven—a large, undulating, tapestry-like work made from aluminum, copper wire, and thousands of bottle caps—with The Metropolitan Museum of Art’s curator of African art, Alisa LaGamma. This sculpture is on view in the exhibition. Listen to or download this Met Podcast episode at www.metmuseum.org/podcast. the installation of Between Earth and Heaven and its significance, go to the “Arts of Africa, Oceania, and the Americas” playlist at www.youtube.com/user/metmuseum. Participants learn about works in the exhibition through description and discussion. This program is free, but places are limited. Reservations required; please call (212) 879-5500, ext. 3561 or email access@metmuseum.org. Teacher Resource Center with a circulating collection for educators. There is also a Children’s Reading Room, a specially designed space for families to read together from books in the library’s collection. For further information please call (212) 570-3788. For further information about our programs, visit the Museum’s website at www.metmuseum.org. The exhibition is made possible in part by The Andrew W. Mellon Foundation, Fred and Rita Richman, and The Ceil & Michael E. Pulitzer Foundation, Inc. It was organized by The Metropolitan Museum of Art, New York, in collaboration with the British Museum, London. email greygallery@nyu.edu, or call (212) 998-6780. The name Thomas P. Campbell probably won’t ring many bells with the public. Inside the Metropolitan Museum, though, the news of his ascension to director is likely to be greeted by many colleagues with pleasure and relief. Read the Met's press release at MAN. Ending months of fervid speculation, the Metropolitan Museum of Art reached into its own ranks on Tuesday and chose Thomas P. Campbell, a 46-year-old English-born tapestries curator, to succeed Philippe de Montebello as director and chief executive. The appointment, effective Jan. 1, was approved in a late-afternoon vote by the museum’s board of trustees after a suspenseful eight-month search that began when Mr. Montebello, 72, announced plans to retire after 31 years in the post. Given the profile of the Met and Mr. de Montebello, a patrician presence who presided over scores of ambitious exhibitions and acquisitions, it was the most closely watched search ever in the museum world. The Met’s committee worked so secretively that some trustees and most of the museum’s curators were still unaware on Monday of its decision. In selecting Mr. Campbell, the Met seems to have opted for intellectual heft as well as continuity. A graduate of the Courtauld Institute in London, he arrived at the museum in 1995 and made his reputation through much-praised scholarly catalogs and ambitious shows involving complex logistics and diplomacy. 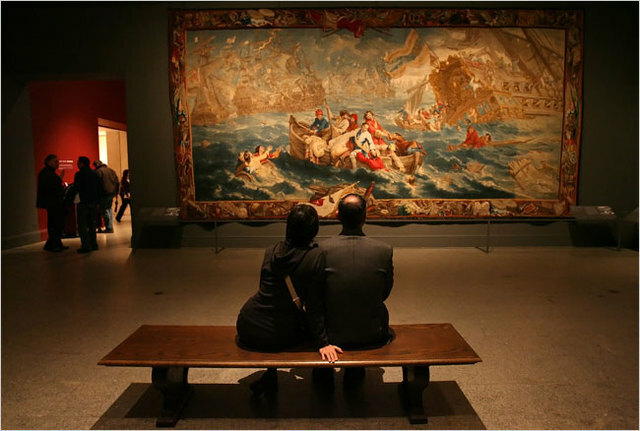 His exhibition “Tapestry in the Renaissance: Art and Magnificence” became the sleeper hit of 2002, attracting some 215,000 visitors, more than twice what the museum had projected, with many works that had never been seen in America.